All three species are Critically Endagered (2016/2017 assessments). Activity Cycle: Diurnal; bimodal feeding pattern (morning and afternoon) with resting/napping in between. Social Groups: Males usually solitary, females with young or solitary, groups of adolescents. Diet: Fruit is preferred; also leaves, bark, seeds, and insects. Predators: Humans; possibly clouded leopard and Sumatran tiger. 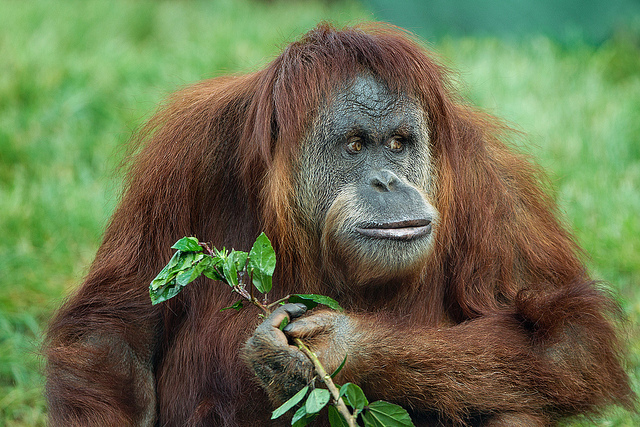 "Ken Allen," the orangutan, was beloved and infamous for his numerous escape attempts; resided at the San Diego Zoo from 1971 until his death in 2000. © 2003-2017 San Diego Zoo Global. Minor update 2015. Taxonomy and Conservation updates 2017.